WASHINGTON – In a stunning setback for a nuclear missile force already beset by missteps and leadership lapses, the Air Force disclosed on Wednesday that 34 officers entrusted with the world’s deadliest weapons have been removed from launch duty for allegedly cheating – or tolerating cheating by others – on routine proficiency tests. The cheating scandal at Malmstrom Air Force Base in Great Falls is the latest in a series of Air Force nuclear stumbles documented in recent months by the Associated Press, including deliberate violations of safety rules, failures of inspections, breakdowns in training, and evidence that the men and women who operate the missiles from underground command posts are suffering burnout. In October the commander of the nuclear missile force was fired for engaging in embarrassing behavior, including drunkenness, while leading a U.S. delegation to a nuclear exercise in Russia. A “profoundly disappointed” Air Force Secretary Deborah Lee James, the service’s top civilian official, told a hurriedly arranged Pentagon news conference that the alleged cheating at Malmstrom was discovered during a previously announced probe of drug possession by 11 officers at several Air Force bases, including two who also are in the nuclear force and suspected of participating in the cheating ring. 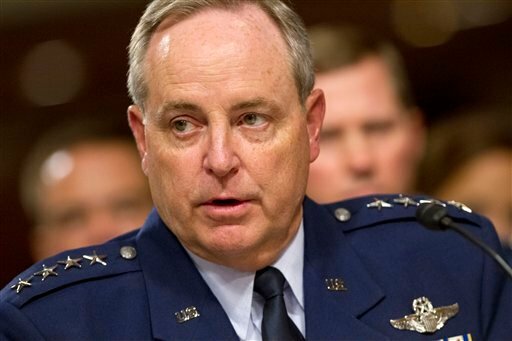 “This is absolutely unacceptable behavior,” James said of the cheating, which Gen. Mark Welsh, the Air Force chief of staff, said could be the biggest such scandal in the history of the missile force. A spokesman for Defense Secretary Chuck Hagel said the Pentagon chief, who just last week visited a nuclear missile base and praised the force for its professionalism, was “deeply troubled” to learn of the cheating allegations. The spokesman, Navy Rear Adm. John Kirby, said Hagel insisted he be kept apprised of the investigation’s progress. 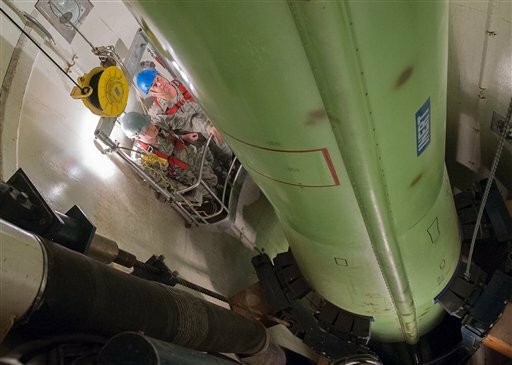 Sen. Mark Udall, D-Colo., urged Air Force leaders to take swift and decisive action to ensure the integrity of the nuclear mission. “There simply is no room in our Air Force, and certainly in our nuclear enterprise, for this type of misconduct,” said Udall, the chairman of the Senate Strategic Forces Subcommittee. James said she will travel to each of the Air Force’s three nuclear missile bases next week on a fact-finding mission to learn more about conditions within the missile launch force and the more senior officers who manage them. She suggested that the cheating was confined to this single case involving 34 officers, although numerous missile officers have told the AP confidentially that some feel compelled to cut corners on their monthly proficiency tests because of intense pressure to score at the highest levels to advance in the force. James, who has been in the job only four weeks, said the entire ICBM launch officer force of about 600 is being retested this week. Welsh said he knew of no bigger ICBM cheating scandal or launch officer decertification in the history of the missile force, which began operating in 1959. Last spring the Air Force decertified 17 launch officers at Minot Air Force Base, N.D., for a combination of poor performance and bad attitudes; at the time the Air Force said it was the largest-ever one-time sidelining of launch officers. There are about 190 ICBM launch officers stationed at Malmstrom. Welsh said the probe continues. “People at every level will be held accountable if and where appropriate,” the general said. The Air Force’s nuclear mission includes operation of 450 Minuteman 3 intercontinental ballistic missiles. The 341st Missile Wing at Malmstrom, where all 34 suspected cheaters are based, is responsible for 150 of the 450 ICBMs. The 34 are junior officers: second lieutenants, first lieutenants and captains. Of those 34, two also are implicated in the drug probe. The Air Force operates Minuteman 3 missiles at two others bases: F.E. Warren in Wyoming and Minot in North Dakota. The Malmstrom unit failed a nuclear safety and security inspection in August but succeeded on a re-do in October. Welsh said the alleged cheating took place in August or September; he said other details could not be released because the matter remains under investigation by the Air Force Office of Special Investigations. The drug investigation that led to the discovery of alleged cheating was disclosed by the Pentagon last week. It said then that it involved 10 officers at six bases – five in the U.S. and one in England. On Wednesday, the Air Force said the number of suspects has grown to 11. Welsh said he could not comment further on the drug probe. James said the ICBM force “needs attention” and that while immediate corrective action is being taken, Air Force leaders are planning to address some longer-term initiatives. • On Wednesday, the Air Force said 34 nuclear missile launch officers at Malmstrom Air Force Base in Great Falls have been implicated in a cheating scandal and have been stripped of their certification in what the Air Force believes is the largest such breach of integrity in the nuclear force. The cheating involves the monthly test on their knowledge of how to operate the missiles. • As part of the announcement Wednesday of the alleged cheating, the Air Force said three ICBM launch officers – two at Malmstrom and one at F.E. Warren Air Force Base in Wyoming – were among 11 officers at six bases implicated in an illegal-narcotics investigation. • In April, 17 missile crew members in the 91st Missile Wing at Minot, N.D., were deemed temporarily unfit for duty and given weeks of remedial training. The wing’s deputy commander of operations complained of “rot” in the force. Later, the officer in charge of the 91st’s missile crew training and proficiency was relieved of duty. • In August, the 341st Missile Wing at Malmstrom failed a safety and security inspection. Nine days later the officer in charge of security forces there was relieved of duty. In October the unit passed a do-over test. • On Oct. 11, the Air Force fired Maj. Gen. Michael Carey, commander of the 20th Air Force, which is responsible for the entire Minuteman 3 missile force, amid an investigation of an alcohol-related complaint. This happened two days after a Navy admiral who was second-in-command at U.S. Strategic Command, the military’s main nuclear war-fighting command, was relieved of duty amid a gambling-related investigation. • The AP reported that twice last year the Air Force punished officers involved in separate incidents of opening the blast door of their launch control center while one of the two launch officers was asleep, in violation of Air Force rules. • In November, the Air Force chief of staff, Gen. Mark Welsh, disclosed that as a result of the Carey firing, the Air Force would take a closer look at the background of candidates for general officer-level nuclear command jobs. • Also in November, the AP reported that key members of the Air Force’s nuclear missile force are feeling “burnout” from what they see as exhausting, unrewarding and stressful work. The finding, in an unpublished RAND Corp. study provided to the AP in draft form, also cited heightened levels of misconduct such as spousal abuse and said court-martial rates in the nuclear missile force in 2011 and 2012 were more than twice as high as in the overall Air Force. The courts martial rate in 2013 declined but was still higher than the overall Air Force. Malmstrom cheating scandal: When do nuclear missteps jeopardize national security? WASHINGTON — At what point do breakdowns in discipline put the country's nuclear security in jeopardy? GREAT FALLS — A contractor has begun work to fill in 50 deactivated Minuteman III missile silos in north-central Montana.